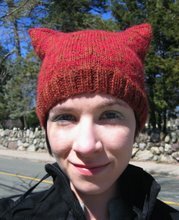 Weaverknits now has an etsy shop! 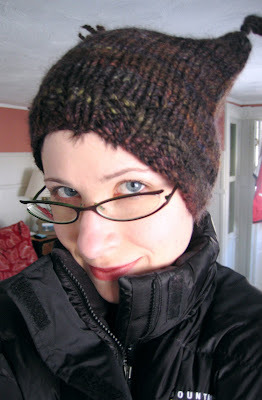 I've decided that I have too much handspun to knit up anytime in the foreseeable future, and that people who do not knit may like a Shackleton hat in colors and size of their choice. 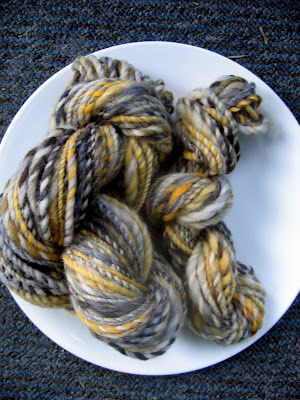 160 yards of Grellow; $30 including shipping within the US! More than enough for a Shackleton Hat of your own! 150 yards of Rainbow; $30 including shipping within the US. Again, more than enough for a Shackleton or any other sort of hat. Jobjob is denying my Unemployment claim, by the way. So I'll also be knitting in exchange for food until further notice. Something is very wrong with a system where you can be denied jobless benefits because someone doesn't like you and can find a technicality on which to fire you, no matter how hard you've worked for them. Very, very wrong. 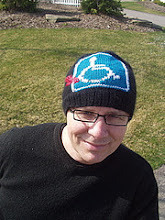 The Shackleton Hat! For your Recession enjoyment! Behold, to fit a 21" head! I spun the yarn for this one with one ply of Blue Face Leicester that I dyed bright yellow and one ply spun from a triple-play batt from Spunky Eclectic. 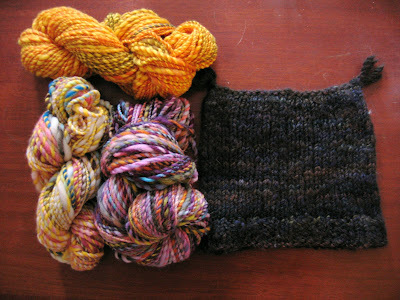 I'm pleased with how I was able to make the yarn color progress from yellow-brown to yellow-orange! How much yarn do I need? Approximately 100 yards of chunky weight yarn. 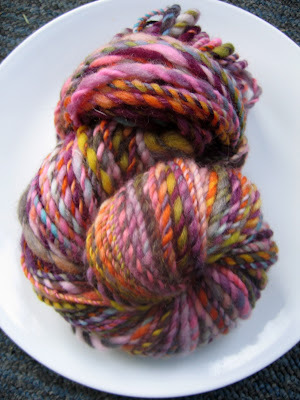 Handspun yarn is perfect, single or multiple plies. If you don't get gauge on US 10 needles, or your yarn is too chunky and dense, try going up a needle size and subtracting 4 stitches from the number of stitches you cast on. 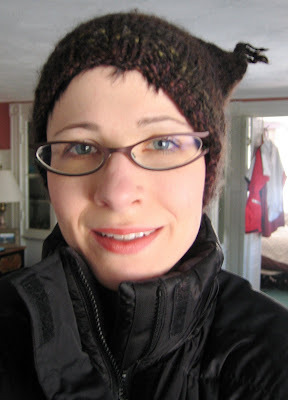 To make a hat for a really big head, cast on 4 more stitches than specified. Cast on 52 stitches (48 stitches if you're working at a larger gauge, i.e. 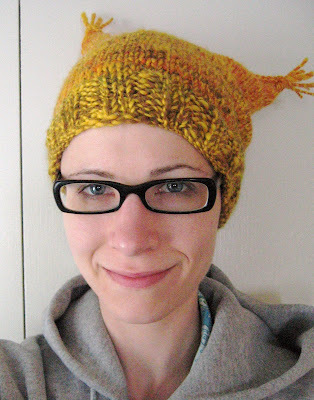 fewer than 3 stitches/inch; 56 stitches if you're making this for a really big head). Join stitches into a round, being careful not to twist. Place a marker at the beginning of the round. Work in knit 2, purl 2 rib for 8 rows. 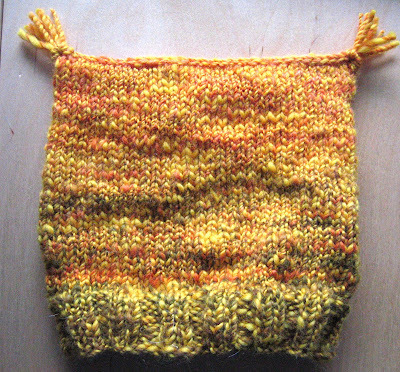 On the next round, change to stockinette stitch (all knit. 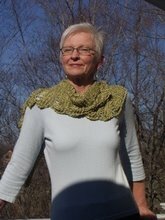 Just knit round and round) and increase 8 stitches evenly around. You now have 60 (56 for bigger gauge; 64 for really big head) stitches. 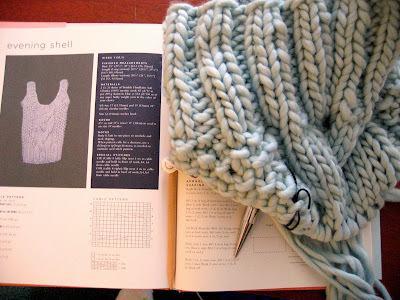 Continue to work in stockinette stitch until hat measures 8 inches from the cast-on edge. 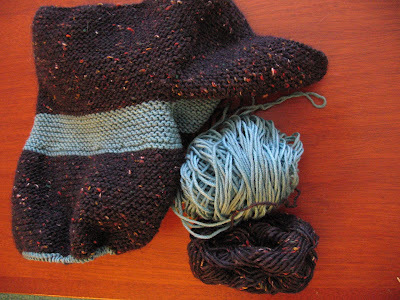 After 8 inches, fold the tube you've knit in half and push both halves to the two tips of your circular needle. Bind off the top of the hat using the three-needle bind off technique: place a third size 10 needle (straight or circular, it doesn't matter) through one stitch from each half of your tube (that is, from each end of your circular needle) as if to knit, and knit these two stitches as one. Do the same with the next sttich, and pass the first stitch over this second stitch. Continue in this manner until only one stitch remains. 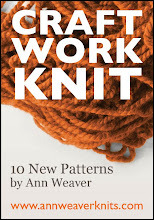 Cut yarn and draw through this stitch. 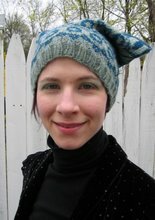 Make little tassels at the two corners of the hat using four strands of yarn, if you like. 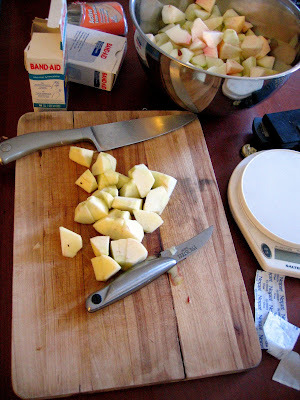 In other news, don't cut apples while watching Maury. That big knife did a number on my left index finger yesterday. Note bandaids. 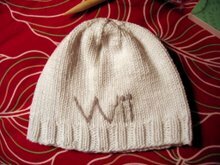 I've managed to customize one that allows me to knit, if slowly. 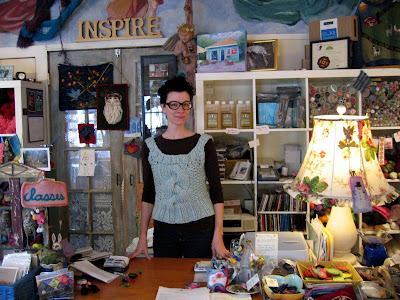 I'll be working at Yarns in the Farms tomorrow from 10:30 to 5:00, if any of you happen to be in the North Shore area of Massachusetts and would like to stop by and chat. Note the Twinkle vest in the above shot... the theme of the outfit was "playing with size." Large glasses, large vest, small everything else. I call the new glasses my "Big Trotsky Look." As in, "Chris, NO ONE OUT THERE is rocking this Big Trotsky Look yet! I must!" I've been knitting a LOT, but I have to warn you that the larger part of my knitting will be secret for the next few months. However, a particularly gigantic project started cramping my hands, so I decided to switch up my gauge for a couple days and use the yarn I got at Yarns in the Farms about a year ago for this chunky Twinkle vest (I tried on the store sample, and Tink exclaimed, "You look so curvy in that!" to which I responded, "It's all an ILLLUUUUSION!"). 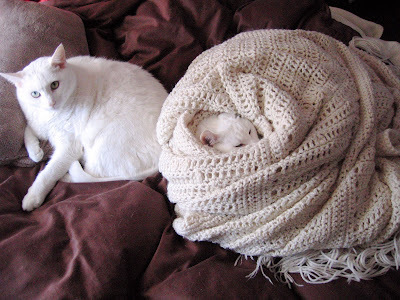 Chris wrapped Max up tight Saturday morning and he fell asleep that way, purring... an hour later Chinaski had joined him. Happy days! Chris goes back to work tomorrow, and I have my first restaurant shift in the evening. Wish me luck! First, the winner of the handspun, chosen in a random drawing because all your suggestions were so good and I wish I could send you all yarn, seriously. Congrats KGLO! Email me and let me know... what is your FAVORITE COLOR? And all the rest of my dear readers, check back, because I'm going to have giveaways as long as this recession lasts, baby, and that's gonna be a long, long time. You blog readers are the BEST. I now have a 2-shift a week waitress/server job at an upscale local restaurant and have already been employing (oh ho ho) your suggestions in my everyday life. Behold! I have joined the Toy Society! I have wandered around a new neighborhood (where I now have a waitress job! Going into a restaurant in the new neighborhood got me a job! ), I have baked a new bread recipe, and I have begun my one-photo-a-day documentation of this period, which I will be keeping on flickr. Not too much knitting I can show, since I just finished up two submissions and have one very large design well underway (all I can say is that it's a MAN design... men need more cool but simple patterns, for sure, and I have several men in my life to provide guidance for me on these), but I did finish my last baby jacket for a while, I think. 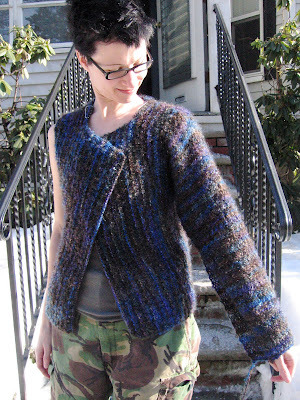 I call it the "Little Professor" jacket due to its tweediness. Anyway, I made it out of handspun yarn, my own 2-ply chunky weight. I have a lot of this chunky that I've been spinning up that would be perfect for Shackleton (or regularly shaped) hats... and I'll be giving a skein of handspun merino or BLF in a color of choice, not limited to the colors shown below, to someone else unemployed or underemployed who comments on this post with a suggestion of a free thing to do to entertain myself. I'm considering listing some other colors as kits for sale. Any interest? Post a comment or email me (weaverbergh13@verizon.net) and let me know (you can let me know your favorite colors if you're interested... I, um, have a lot of roving to spin). Thanks to everyone who commented on my last post; it's nice to know that I am in good company. 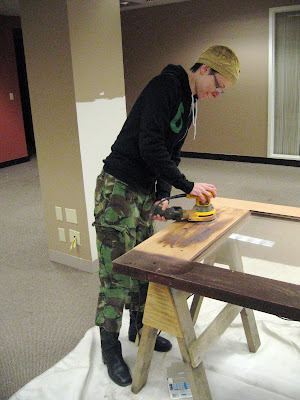 The job, well, I'm not sorry that I no longer work there, but I would have liked things to end in a less negative way. In any case, I have had much more time to knit, which has included sending in a few submissions and finishing up my obligations. Behold! Lady of the Lake Jacket as modeled by Mom Bergh! 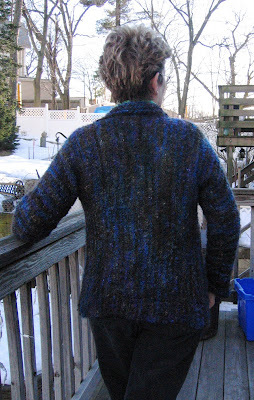 Side and back photos came out well... it was a little dark (New England winters! Gah!) so I didn't get any good front photos, but they're coming! 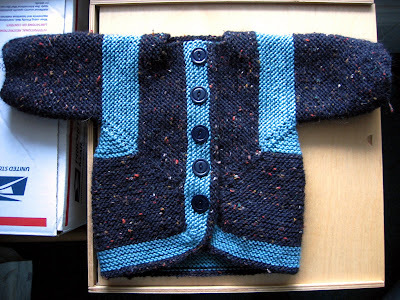 In other obligation knits news, one more Baby Surprise Jacket for one more baby who will be joining my extended family this spring. This one is tweedy and reminds me of a little professor man garment. Praise unemployment, I've managed to do this much in a day! Next post: Recession Series pattern #3! It's official, I've been let go from jobjob! My first experience of what a sinking economy combined with personal, um, differences does to an architectural/engineering firm. oh, and expect more free Recession Series patterns. She is looking lovely, but needs 1 more sleeve and a collar. This jacket is a SLOG! 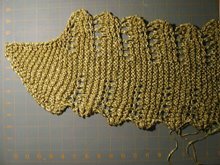 The boucle yarn, the rows of moss stitch, the boredom of it, oh, it just goes on and on and ON. 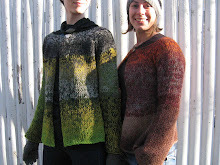 (ooh, just went to the Colorsong Yarn website and saw this new kit. Oh my). The upside? It is gorgeous. I was knitting at the People's Republik in Cambridge over a few beers the other night, and strangers reached out to touch it and ooohed and aaaahed. Male strangers in their 20s and 30s. The slog pays off if it generates this kind of magic.